I recently had a conversation with a good friend about how an organization should work with their employees and also what the individual employees should do. During that conversation she then told me the following equation: Imagine, you sit in the car and drive past different pastures. At the first pasture, you see a brown cow, just grazing. It is a beauty of a beast but you just drive by without giving it special attention. At the next meadow, you see a beautiful black/white spotted cow that is just doing her own thing…grazing. Again you just drive on. This continues for a while then you see large herds of cows. Then in other fields, there are only a few. In all cases, you drive just by without really paying special attention to the animals you see. But then you come to a meadow where you see a purple cow at the fence. It would be a normal reaction that you put the car on the side, get out and get a close look at the cow. Many of us will pull out their smartphone and take a photo or selfie with the cow and post this on social media to let everyone in their circle know about the special experience that they have at that time. Others even will go a step further and try to achieve a product (milk or cheese) from that cow. Now put the driver in the car in the place of “the customer”, the cow in the role of yourself as a “professional” and the pasture is the synonym for “the organization” you work for. By doing this you get an interesting setting that you can view from different angles. Yes I know, many of the (European) readers will now think of a delicious bar of milk chocolate. But that is not what this article is about. Just as in the example, there are many, almost similar, other cows. The judges (the customers) drive by and with a little luck they choose the products or services that are being provided by that particular company. It does not matter which cow is doing the job, as long as the service is delivered it is ok. A purple cow comes with a specialty. It is a cow that attracts attention! A cow that is so special that it draws the attention of the judges (customers). A situation in which people will know to find you and the company you work for, not minding to stand in line to take a selfie with you, the purple cow. Actually, this is simple; You are, or you make sure you become a purple cow!. Some are gifted with some of nature’s gifts. Others develop a specialization which is very popular at a certain moment. But mind: “A good idea/skill without an audience is doomed to die”. In other words, everything depends on how you present these gifts or specializations to the world. It is not only about having the specific knowledge or skills. An increasingly growing factor is the way and how you place yourself in the modern market. Are you participating in the right knowledge groups and are you consciously building your track record? The present market environment can be characterized with words like; fast, innovative, disruptive and do not forget agile. We can argue about to what extent this actually is true. But these type of terms do bring forth emotions that lead to (sometimes almost panicky) actions of companies. “Who can help us because if we do not go now, our competitors will be above us and then ……” More and more you see that these companies just want a fast relief of their “pain” and the first step they make is to go online in search for the “authority” in this field. They will ask Google for the best company (read: first in the list) to help them out. For the supplying the party, it is therefore increasingly important to place their “purple cow’s” at the fence of their meadow. This can be done by getting the status of an “Authority”, or with an excellent online presence. Having a good reputation or status of authority has a great influence on the degree of initial trust people have in your organization. This initial trust is a very important factor to start building a good relation between the supplier and the customer. The next steps then subsequently determine whether this trust will grow. Although this article is about you being a purple cow, I still want to point out that having a clear mission and vision as an organization is very important for building your herd. When you know where to move to, it is easier to perform a targeted search for the right “calves” (read: school / young professionals ), or the appropriate purple cows in the market to bring inside your organization. Bringing them in is the first step but once you have built a solid herd, it is easy to exhaust them completely by forcing them to perform and when it appears that they can do no more you sell them for slaughter and try to make some more money from them. On the short term acting like this may be lucrative but at the end, none of the parties involved will be happy. It is much more enjoyable to learn to cherish your cattle, encourage them to develop their talents and reward them with fresh green grass. Here in Holland somewhere in spring it always is a pleasance to see the cows frisking into their pasture. After a whole winter being locked up in their barns, it is a true feast for the cows to go out into the freedom again. 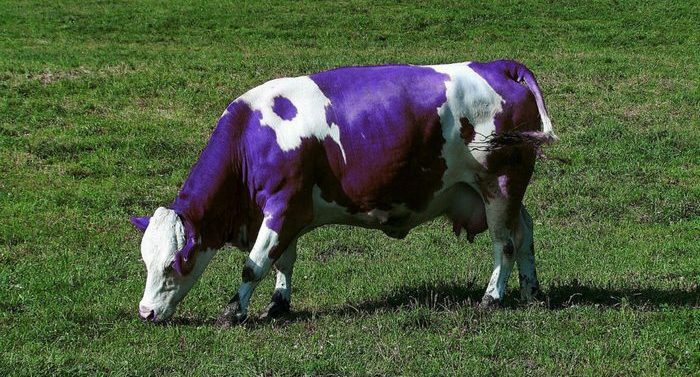 Thus remember, the average “purple” cow within your company also needs some form of freedom. Let the employees thrive. Facilitate their potential to grow and update their knowledge with available training and literature. But also encourage and facilitate them to communicate with the outside world. Encourage the team to go to network events (How to grow your network), ask them to publish or accept keynote positions at events. Also, you can provide them with a blogging page on your website. From the foregoing, it may seem as if all the obligations lie with the employer. Well, this distorted picture has to be deleted immediately. The key to success lies in the correct proportions and interactions between employers, employees, and the (potential) customers. 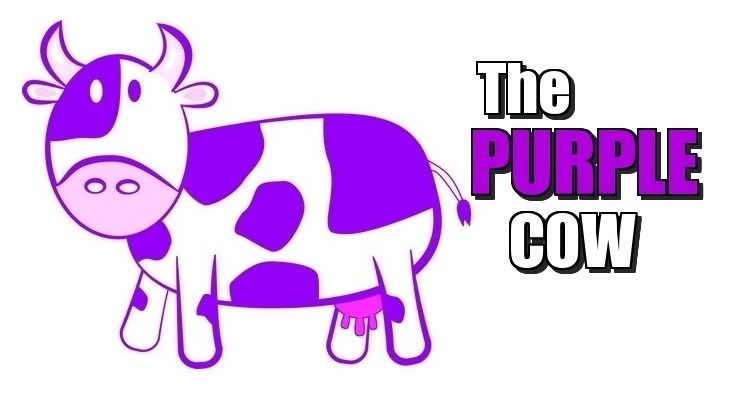 As an employee (purple cow) it is also crucial to ensure that your purple color does not fade. Realize that your added value makes the difference for the company you work for. They provide the right conditions in which you operate, but the purple color is on YOUR skin. YOU make the difference and it is, therefore, YOUR duty to make sure that you keep your knowledge level on point. Present yourself in a correct and excellent way and make sure you deliver the added value. Only in that way, the (potential) customers will keep coming to take a selfie together with you and let the world know how special enlightened they are with the purple cow they found. Interesting take on Seth Godin’s book The Purple Cow. Thanks for the thoughtful commentary and advice. Thanks for sharing this post. I am very interested in this topic. I would like to share my opinion on this. There needs to be ample house within the ready room for you and your canine to sit down comfortably whilst you wait on your appointment. The examination room is essential: cleanliness is clearly paramount, however, take a look at the small print, too.